The Vampyr is an offshoot of Australopithecus, much like our shared distant cousin the Lycanthrope. Both species are symbiotic hominids, carrying transferable Immuno efficiency pathogens – viruses abundant in the blood and saliva that can be transferred to human and non human hosts, where these unique genetic traits are inserted into the DNA of the infected, taking on the characteristics of each species. Homo Vampyrus is a nocturnal hominid with a huge dependency on iron and protein. His research garnered a great deal of criticism, yet most of his work was completed in private. One of his many employees would present him with a shipment of species from sub Saharan Africa, the Amazon and parts of India. Yet it was a bone fragment that piqued Gerbers interest in the lesser known hominids. On December 14th, 1780, Gerber unpacked a collection of specimens from the Far East. 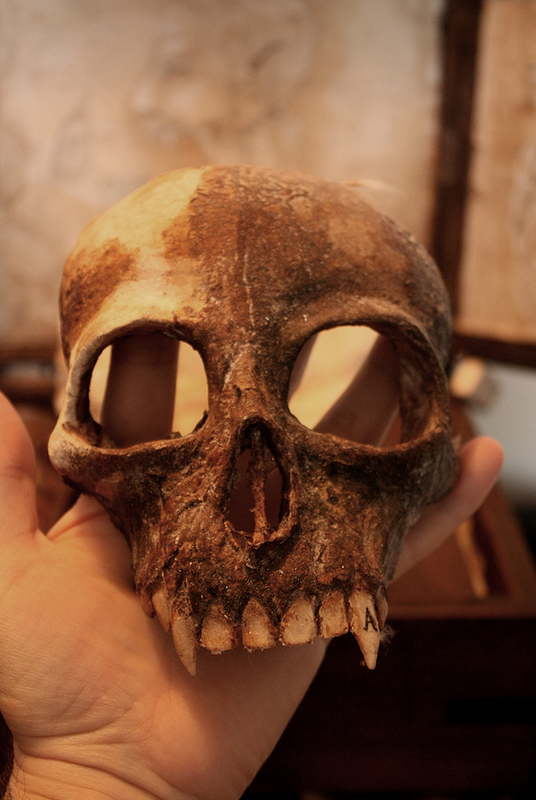 Amongst these samples was a partial skull fragment of the upper mandible and part of the brow. The teeth were intact, and clearly very unique. The upper cuspids were distended and serrated and although in a state of decay, connected to the bone tissue by a complex musculature, which allowed the teeth to protrude and retract from two fissures in the jaw. His hasty communications to the collector he had bought the pieces from, pointed to a village on the eastern shore of Lake Baikal, in Mongolia. He traveled to this destination, a destitute collection of huts nestled in the icy inlet of the great body of water. It was here he was introduced to a man, whose daughter had been murdered by what the villagerscalled a “Blood thief”. Gerber was escorted to a shallow grave where the killer lay, who had been caught and lynched, leaving his mangled corpse to the elements. The head had been removed, yet the body was preserved by snow. He was told that the creature had fed upon the child, removing most of the organs and consuming them, but also drained the body of blood. He asked for a place to examine the body, which was provided. It was here he made his first examination of what he coined the “Nocturnal Hominid” or “Homo Vampyrus”. A primate whose body appeared augmented by a form of parasitic virus. 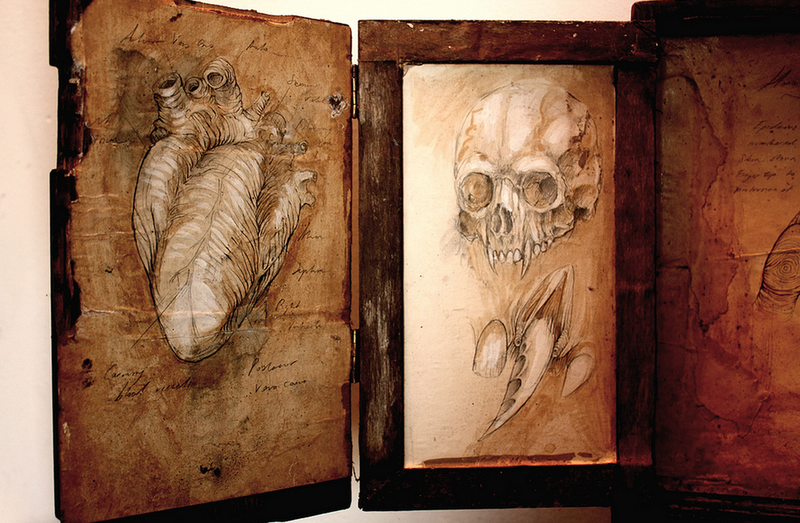 His studies of the Osteology, and organs provided ample proof that this body was in fact not human at all. 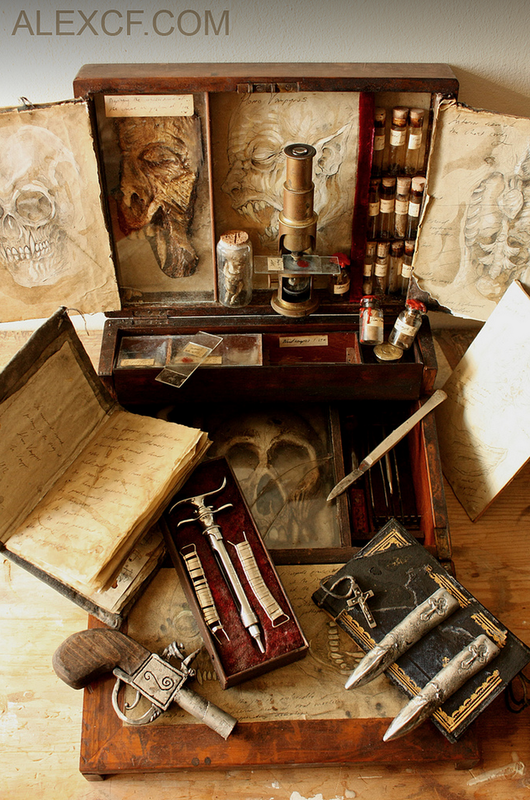 So began Gerbers extensive research pertaining to the Vampyr. He soon collected a wealth of knowledge, and most importantly revolutionised the study of Hemoglobin, through invention of sophisticated microscope apparatus. He was fascinated by the behaviour of Vampyr blood cells and managed to dispel the myth that these creatures only fed on human blood. Eventually, over the remainder of his mortal life, he tracked these feral Vampyr to the source. The Altai Mountains of Mongolia. It was here he found Thenis, the Vampyr stronghold. His communications with those who dwelt within passed between himself and loyal human familiars, until eventually he was granted access to the city. His first encounter was with Damat, the son of Demeclev, a 12,000 year old whose own research of evolutionary biology stunned Gerber. He spent years with Damat, until his age began to get the better of him. It is believed he consented to infection, and thus a form of immortality so that he could continue his research unabated by age. Around 1836, a cleric by the name of Abramo was called to perform an exorcism in the small town of Selia, 50 miles outside Rome. Here he was confronted with a child that displayed no supernatural affliction, besides heavy wounds to her neck and stomach. What frightened him the most was that she lived, regardless of these mortal lacerations. Her laboured breathing spoke of something far worse than the medieval superstitions that filled the book he held close to him. He stayed with the girl for a few days, praying for her. In this time her wounds began to heal, yet they healed exceptionally slowly. Her body was constantly drained of energy, and he noticed that her very appearance was beginning to alter. The facial muscles seemed to spasm under the skin -as though her body had different plans for the little strength she could muster from the feeble meals he forced her to eat. On the fifth day, she fell into a coma. During this time her physical form continued to change. He saw visual afflictions to the upper and lower jaw, she bled almost constantly from the mouth. On the 20th day, he found her sprawled in the corner of the room, her face buried in the stomach of her mother. 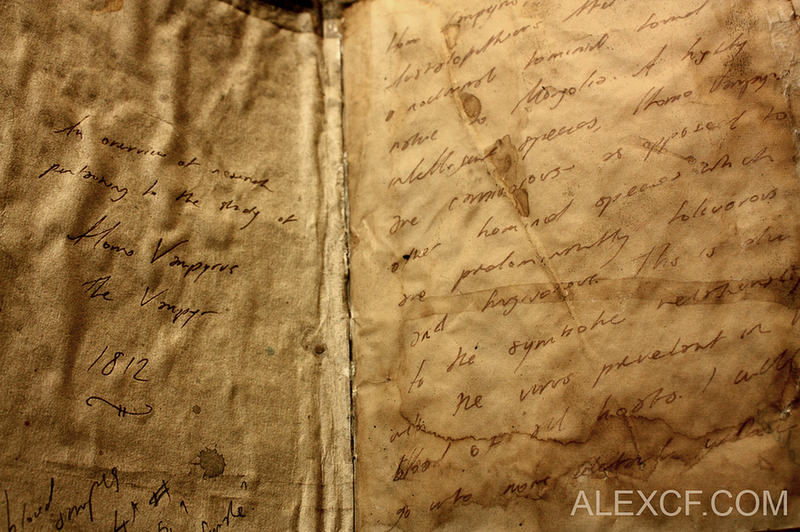 He now knew what he was dealing with – a night ghoul; Vampyr. He sought out the weapons of defense and began a pilgrimage, to slay the beast who had taken this child’s life. But the story did not end here. As he followed the path of death across the villages and towns of Italy, up into north east europe, he learned of his quarry. On a fateful night, at the apex of his journey, as he spied the vile culprit stalking a sheep, a presence who had followed the cleric for many days made himself known. A tall pale man, dressed in bizarre clothing that was reminiscent of feudal japan, stood before him. He told Abramo that his name was Dervolt, of the house of Demeclev. He was a Vampyr, who had been sent to find the feral murderer who Abramo hunted himself. Dervolt spoke of his respect for the cleric, and wished him to know of the real culture that hid behind the demon of folklore. The Cleric agreed, thinking nothing of the creatures declarations of friendship, yet his curiosity was piqued. They traveled for many weeks, only by night, until they reached the Altai Mountains of Mongolia. It was here that they took a treacherous path, almost impossible to climb, yet Dervolt was incredibly agile, and helped where he could. They reached the zenith of the path – an opening in the mountain side, and within – a seemingly endless cavern. Before them lay a city. It was pale, lifeless yet utterly beautiful; as though constructed from bleached bone and charcoal. The light seemed to hang all around yet fell from no fixed source. It people were of similar stock, like shadows of humans, drifting like skeleton leaves to and fro. “This is my home, the city of Thenis” spoke the Vampyr. It was here that the Cleric Abramo befriended the ancient people of Thenis. Built 30,000 years BCE, Thenis was the stronghold and citadel of the vampyr nation. Built in concentric circles, around the central cathedral, Thenis was a place of learning for the ancient porcelain faced hemophage who had lived since the dawn of their race, they possessed the knowledge of thousands of generations. They were carnivorous, dependent on high iron and protein diets, yet their lust was quenched by production of iron rich foods, without resorting to blood feeding. He took this knowledge with him back to Italy, where he continued his studies. Along with various other cryptobiologists, they sought out the rarest specimens of flora and fauna, and forged cures, poisons and elixir based on their studies in the annals of Thenis, the great libraries of thought. and in return, fed the old ones the information of the modern age. 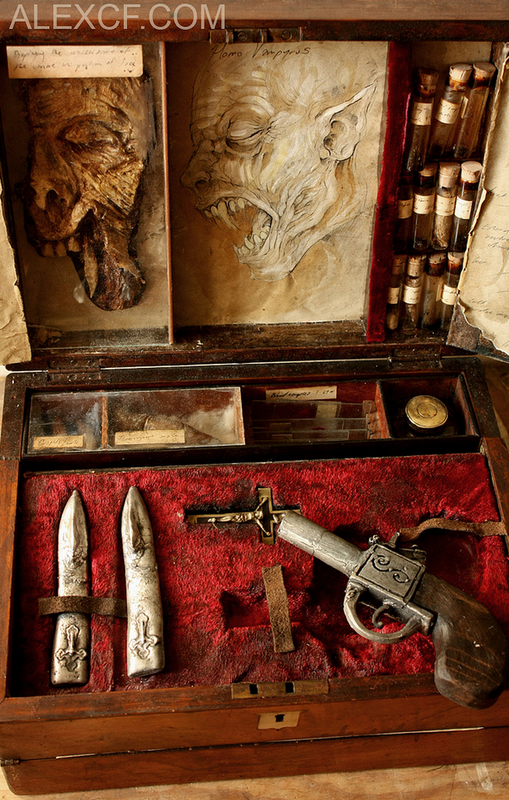 Contained within various cabinets are the possessions of a hunter turned explorer. 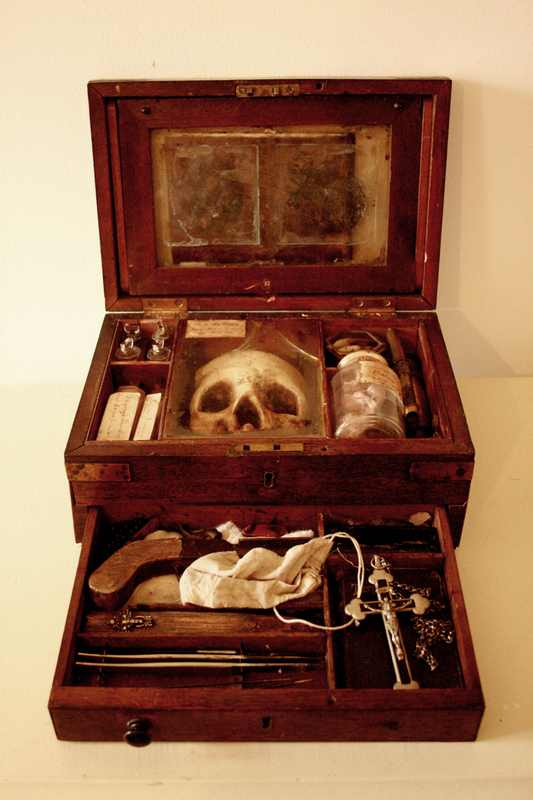 The partial dissected body of a newborn Vampyr, the skull fragments of an adult. 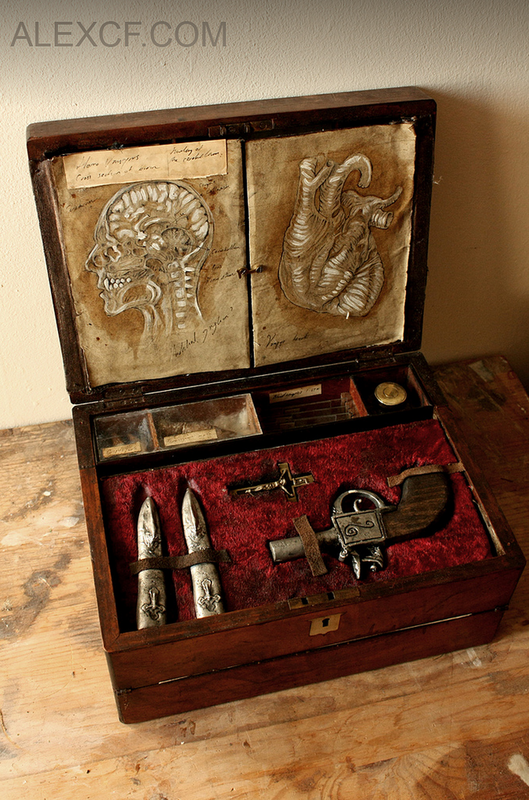 The organs that separate us from the Hemophage – and the tools to carry out the research; bone saw and hammer, scalpels and knives. Microscope and blood vials, plant samples and specimens. Books filled with notes and diagrams, and the remnants of a slayer.